The Simple Life of a Queen: Two Weeks Already! Happy Friday Morning Everyone! It's been two weeks since I last posted, although I have been trying to keep up with all of your blogs and posts. My life is relatively unchanging these days. I truly appreciate all of the thoughts, concerns and well wishes from you all. I went to the doctor on Tuesday and although I still am on a weight restriction of no more than 2 1/2 lbs. for another 6-8 weeks, no vacumming, etc., I have been up and around a bit more. He also sent me to physical therapy which began on Wednesday. Very light exercises, to me they aren't even exercises! Lifting my arms above my head 20 times. Rolling over in the bed. That's it! The therapist said after his exam that I also damaged all of my lower back muscles in the fall and they have to be rehabilitated too. Plus, everything below the actual break absorbed some of the impact and the joints are all "jammed up". I am a bit better but both doctor and therapist want me resting in the recliner more than I'm up and about because the bone is still not healed fully. Which has made more time for crafting! This is a hat I made for my friend from church. 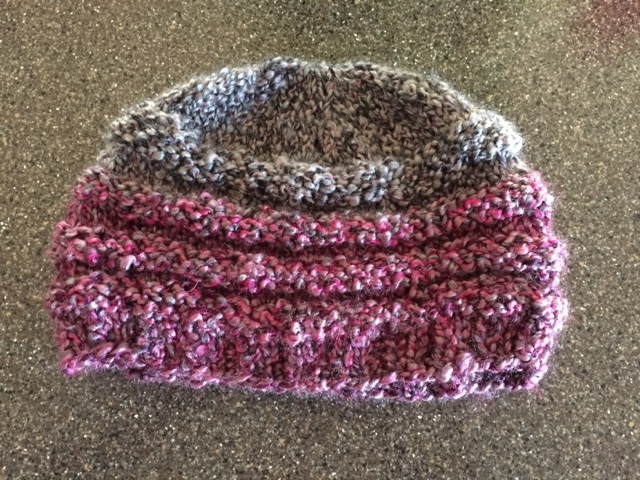 I made the pattern from a store bought hat she loves so I named it the "Teresa Hat". I've made several of them for her over the past year or two and this is the latest one. She brought me the yarn and I made it in about 2 hours. I've made myself one too and have to say, it's the most comfortable and easy to wear hat I've ever had. I also got a Knit Picks order of sock yarn in the mail. I've already finished a pair of socks from the two small balls of green, tan and cream. It's called "Chickadee" in the Felici line. Here is the rest of the order. Most of this will be used for socks for various people in my family. It's never too early to start on Christmas gifts is it? A closer look at the speckles. I LOVE, LOVE, LOVE the speckles. The Corner to Corner crochet blanket has been taken back out and I'm hoping to finish it today or tomorrow. Miss Piper has asked for it to wrap her baby doll in and I'm happy to take care of that need for her. She loves the bright colors but I'm still not sold on them. 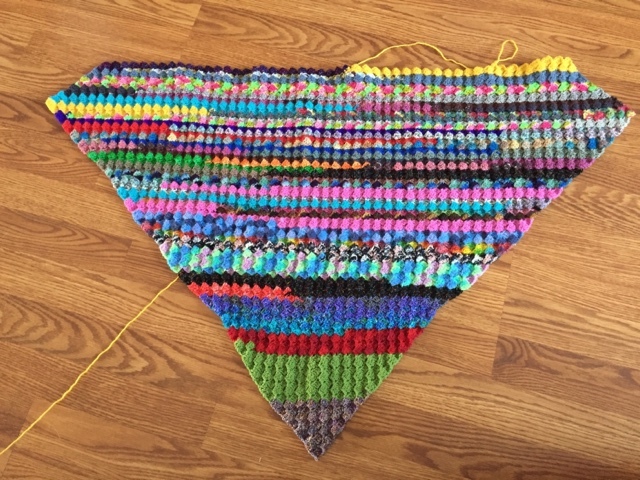 :-) It will be about 36 inches square when done. Hubby went to Michaels for me last Sunday and bought the yarn for this wedding blanket. We had a couple in our church get married and I wasn't able to get to the store to buy the yarn. When I had a 20% coupon off all sale and regular price items this last weekend, it was too good a deal to pass up. We face-timed while he was there and he was able to get exactly what I needed. Plus, the yarn was on sale so I got a great deal! It's hard to tell from the photo but it is a Queen sized blanket. The photo on the left shows the detail a bit better. I made this in just 9 days, in between the hat and socks! 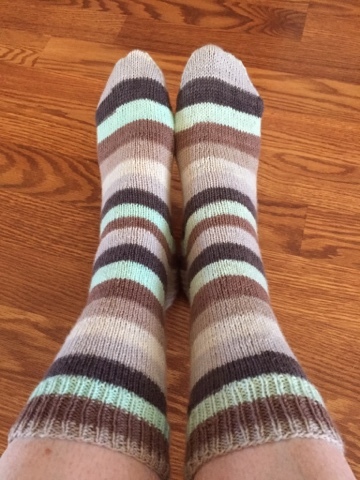 And here are the socks made with the Felici "Chickadee" yarn. Plain vanilla socks from Stephanie Pearl-McPhee's pattern. So easy and nothing to memorize. Just knit and knit and knit. I really like making this pattern. It's my "go to" pattern for when I travel. 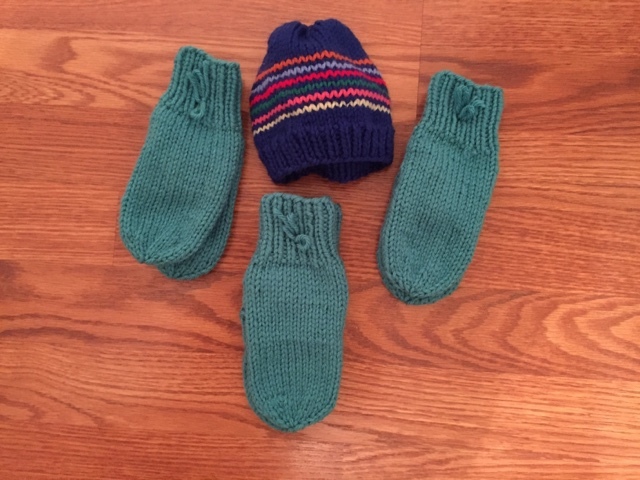 A few more pairs of mittens and a lonely baby hat. I have to get cracking on these and get more made. My pretty Valentine. She sent this picture to all of her grandparents. Debra from the "Araignee" blog on my sidebar sent me this lovely package. 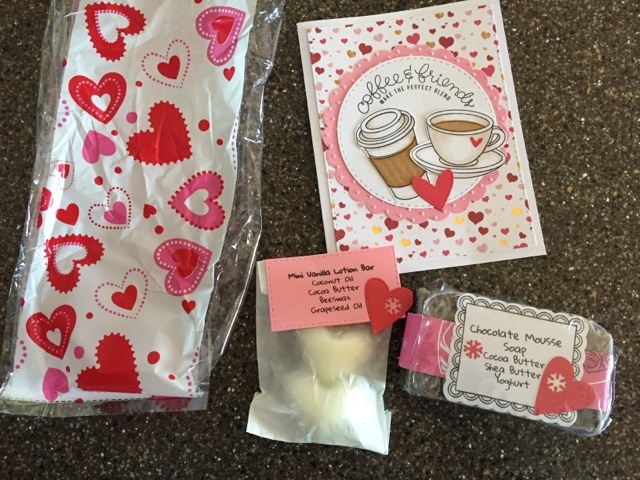 It has CHOCOLATE scented soap and lotion bars as well as this pretty card she made. All of you who know me, know how I adore anything chocolate. I love her lotion bars. I have one right by my knitting chair and in my bag as well. Thank you so much Debra. You are so generous. This is the view this morning out our front door. About 2 1/2 foot of snow still on the ground and it's flurrying outside my window. We've had snow 3 days this week and more predicted for Sunday and Monday. I truly believe it's the never ending winter. And some places have had NO snow this year. It's been in the 70's at Mandy's all this week. 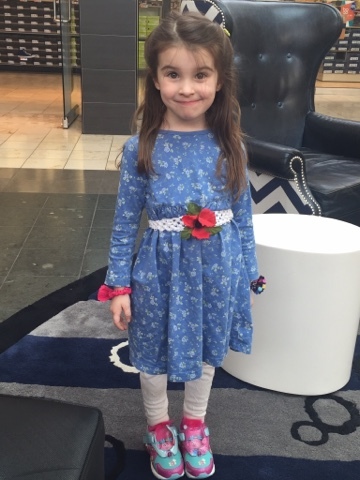 Yesterday I got this picture of Miss Piper at the shoe store getting new tennis shoes. Her little feet grew right out of her old ones. She's getting so tall too. Don't you just love that face? The newest news is that Mandy, Brad and Miss Piper will be moving again. Their house went on the market yesterday and their new destination will be Omaha, Nebraska! Still not here with us, but all of our extended family and Brad's family are there. My brothers and sister, Dennis' sister and Mom. All of our cousins and Mandy's cousins. Brad's brothers, parents, cousins, aunts and uncles. You get the picture. A huge support system and a fantastic job for Brad. He's in Texas as I type this looking at a Piper Comanche airplane to buy. I think the move will be a vast improvement in their lives. Family is important. We're seriously considering moving back there after Dennis retires. We absolutely love the Pacific Northwest, but family is much more important than where you live. As I get older, I realize that more. We both grew up there and still have lots of friends there. Time will tell. Have a lovely weekend and thank you all for visiting me today. I too am saying prayers for you to mend fast. The yarn is gorgeous and the little ones so cute. Take good care of yourself and listen to what the doctors say. You've made excellent use of your time in the recliner: each of your finished projects are beautiful. What a gorgeous gift to give the newlyweds - a treasure. 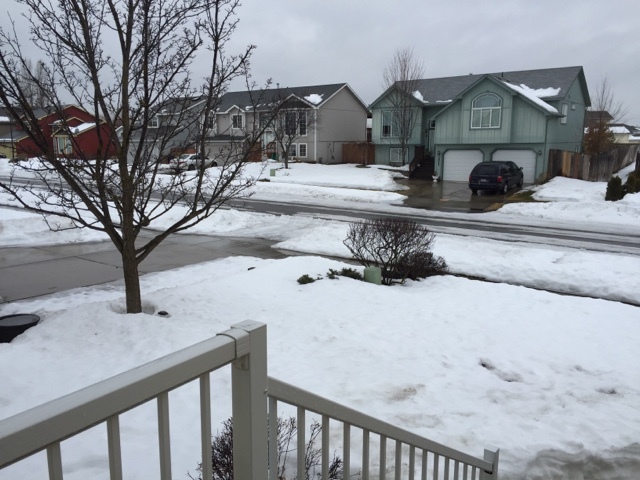 Winter continues on: a storm dropped another foot of snow yesterday. I shoveled multiple times to avoid straining my back and knees. Sun is now shining, and I'm happy. Physical therapy is amazing and successful. Do your "homework" and you'll be well in no time. Hi Betsy, it sounds like you've had quite a road with your recovery from the fall. I hope the exercises will be the key to getting you back to normal. You've made so many pretty things lately. I especially love that cream-colored blanket, how beautiful. It was great to see Piper again, she is getting so big! A real little girl now, no baby anymore. She's beautiful. I hope your snow eases up soon, you've had quite the winter! So...sorry to hear you have been in the wars (that's what my Gran would say to me when I was poorly!! :-). Sending lots of positive get well soon vibes from across the pond! Just love that wonderful wedding blanket! 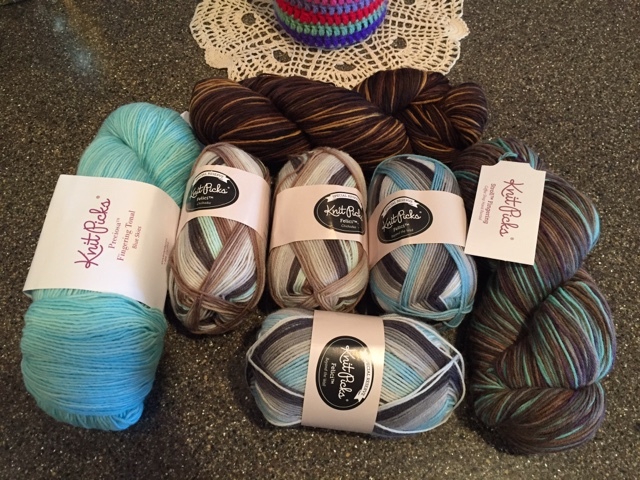 That is one spectacular Knit Picks haul!!! As always your projects are amazing. The Little Miss is adorable. Happy to hear that they are getting a little closer to you. As for your snow....wow. The nice weather has been a gift but I do miss a real winter and snow. I never got a chance to wear any of my knits this year. Most never even got unpacked. I am very happy to hear you're in PT now. Hoping they can help you as much as they did me many years ago after I injured myself. I am over winter at this point and just longing for sunshine. Hang in there! Betsy I pray you will mend soon. Miss Piper is so adorable! I love the pretty winter picture. Though I hope we get a little more snow, I'm ready for spring and my first experience with spring planting. Betsy I am sending you a hug from across the pond and know that you are in my prayers. Miss Piper is really growing up, you are so right she has such a beautiful face. Good news that they are able to move and be nearer to family. 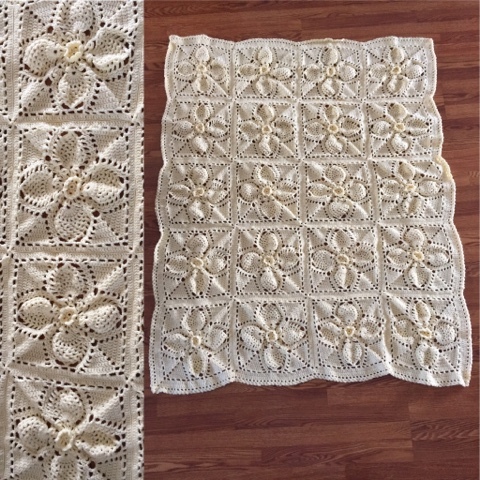 All your projects are wonderful, but I particularly loved the wedding blanket such a great pattern. Take care and look after yourself. Dear Betsy, so sorry you are still having so much trouble with your back. I hope you have a fabulous therapist. My best friend in North Carolina has had an awful one, I told her to quit and go to someone else. THere is no way you should be in a load of pain after therapy, remember that. Love all of your new yarn. I think the plan to move closer to family is a good one. They need you as much as you need them. Piper is so adorable and getting so big. 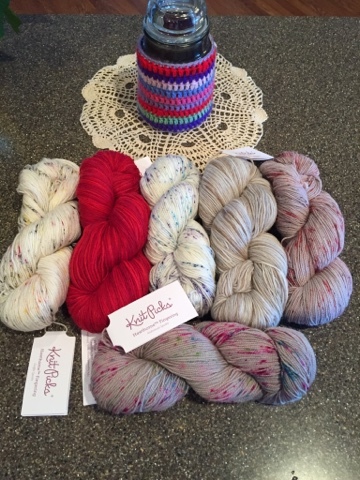 I love getting a KnitPicks order-what a great way to while away your recuperation time! Keep feeling better-you sure do produce beautiful knitted goodies! Betsy, that wedding blanket is just amazing. I'd answer NO its never too soon for creating Christmas gifts. Your advice on moving and thoughts on family ring true for me. I hope we are all closer soon, as far as my kids and our too far away locations currently. Your Piper is so sweet. love the new shoesies! Praying a little prayer for your rehabilitation to be successful! That wedding blanket is gorgeous! Where did you find the pattern? 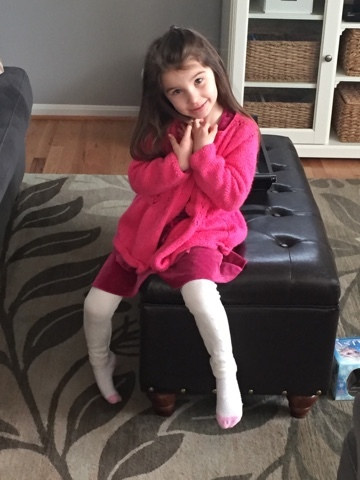 Your little Piper is so cute! Grand kids are so much fun, aren't they? 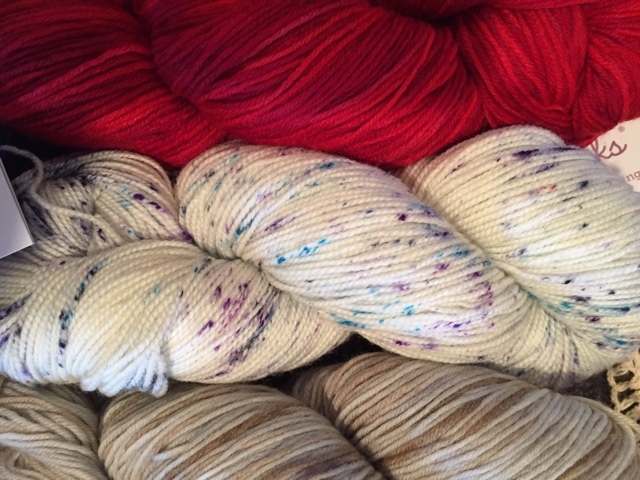 Your new yarns are fun, especially the speckled ones. Hope you continue to improve as you work through rehab. It's so good to hear from you! Just the other day I was wondering how you were doing and then next day your post appeared! I'm thankful you are bit better and you will continue to get better! Long road ahead and thankful there's hope! Piper is so cute and thankful you get photos of her alot. I enjoy all your photos of your knitting and I enjoy speckled yarn as well. We had a lovely day out even if it was 47 and rivers on the high mark...wow! Mixed winter showers tomorrow supposedly but no snow here. I could see snow in the foothills though and it can stay there! I'm glad yours is finally going away! Take care my friend and continued prayers for your healing and well being! God has got you, my friend! Hugs! Glad you're improving little by little and think you're very wise to listen to dr and physical therapist (we call them a physio, over here in our typical Aussie way we abbreviate everything). Love the crotcheted queen size quilt am amazed at how quickly you put things together, you're such a speedy worker. So head house on sale and praying for soon Miss Piper and family to be near you, as she is so adorable. A car trip is achievable where a flight is not. God is very God, and upon Him we rest on those everlasting arms. Sending hugs and prayers from a warm summery Oz. Oh, it was SO nice to visit with you today! I have missed you and your posts. I am praying for your healing, sweet friend. So sorry you are still so restricted, but you surely are making the most of it...SO many will be blessed by your "down time". You are such a dear blessing to so many! That wedding gift is something else...oh, that is SO beautiful! They will think of you and your precious kindness each time they look at it. And, dear Miss Piper! She is so precious!! My, she surely is growing quickly and just gets prettier with each picture you post. God bless you today and heal you and grant you peace and joy in Him. :) Sending you love and hugs!